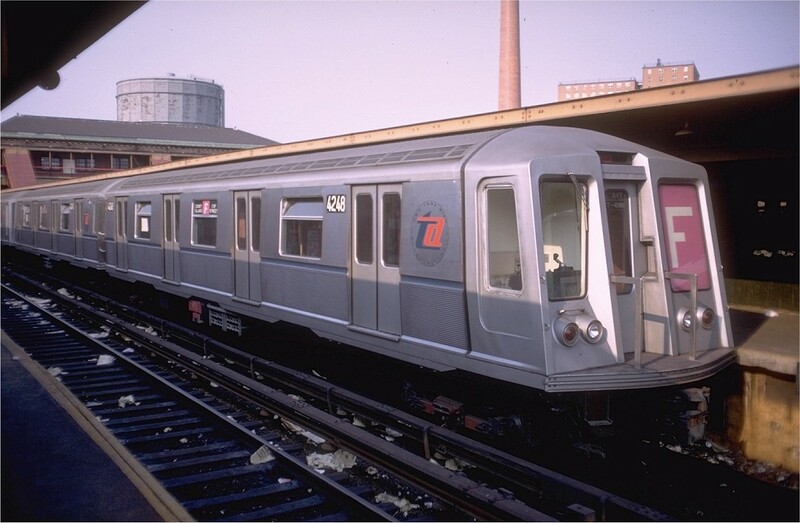 In January 1968, the gleaming new R40 car made its New York City debut along the F line. These cars designed by Raymond Loewy became rail fan favorites. With their familiar front slants and large windows, the R40s provided straphangers with a clear view out the front or back of the trains. Today, though, the era of the R40s is over. Already, most of them have been replaced by R160s, and according to Rail Fan Window via a Subchat poster, the last R40 will roll off the line at around 8 p.m. tonight. The Transit Museum will receive a pair of cars, rumored to be 4280 and 4281, but for one final ride, catch it on the A. This is the second class of car that both entered service and was retired within my lifetime (the R-38s were pulled off the road earlier this year). I feel old. Of course, there are still R-40s in service. Because the sloped end was ultimately unsatisfactory, the last batch of 40s was delivered with vertical end caps similar to those designed for the R-42s. These “modified” 40s are still running. Modified R-40 cars 4572 and 4573, the pair seen in the famous chase scene in The French Connection, are based out of Jamaica Yard. I caught them a while ago in E service. I hope they save those two for the museum. Correction: 4572-3 are R-42s, not R-40Ms. Thanks for linking to my post. So I rode the last slant set from Lefferts Blvd to 207 St and then back to 14 St. It was heading to Far Rockaway, and then likely it would return to 207 for the last time, where it would be taken out of service. That’s probably going to happen some time in the next half hour. So sad. These were and are great cars. Why are they retiring these before the R32s? They’re the oldest trains in the system, from 1964 (only four years older than the R40s, true, but they seem much worse). They are by far the worst cars in the system, in my opinion — slow, noisy, dirty, dim, and just plain unpleasant to ride on. Thankfully, they’ve been replacing them with the R160Bs on the E, which is where I usually used to encounter them, but they’re still running on the F and R, as well as occasionally on the A/C/E. I don’t regularly get R40s, but I hardly think they could be as bad. The R40s are actually in worse shape mechanically—the roofs are literally duct taped and bondo’d on in many cars. The R32s are unpleasant, but still kicking it… either way they’ll too be gone soon! Good riddance. The slants were an eyesore that New York is now finally free of. So was the slant a purely aesthetic thing? Loewy is an interesting character. His best work, in my opinion, was his early industrial designs done in the Depression, when updating and modernizing existing appliances and devices made them more appealing and added to perceived value. I think he made his reputation, and then once he had a big staff of talented designers, tended to leave the real work to them. His GG-1 Electric Locomotive is a masterful iconic example of streamlining, but the streamlined steam locomotive he did at roughly the same time is a misshapen excrescense. The Avanit was so beautiful people are still producing hand-built versions of it. But Loewy designed a personal one-off sportscar for himself, and its an ugly laughable agglomeration of styling gimmicks and cliches that makes you wish you’d looked at a Solar Eclipse instead. My guess is the best of the later work was that of his staff, and his personal designs were by then hackneyed. Like many designers, Loewy had in mind a purity of form that didnt take into account the realities of how the design would actually have to operate, and the Slants had to have safety appliances and other hardware appended to them, which mussed up the original design purity. The the R-40s & R42s were also merely stainless steel sheathed, rather than 100% solid stainless, like cars from Budd. Thats why theyve looked so ratty for so long. Still, sorry to see ’em go. Every time I saw one, even one down on its luck, it was a little like seeing a GG-1 or Avanti go by…..
A friend of mine talked to the designer at the Loewy firm who did this design. The designer explained that it had not been made clear to him that the end had to also be a middle. You can style an end pretty freely when it doesn’t have to be a middle. Styling an end that also works as a middle is harder. I’ll nominate the BMT Bluebird as a good example, although it doesn’t provide the between car barrier (pantograph gates). PATH cars aren’t bad, either. Note to Kid Twist: Wait a while, it gets more so. I was working for the TA when R-27’s were being delivered; then wrote the spec for LIRR M-`1’s, which are also history. When I worked on R-62 spec (after R-44/46), TA people wanted to “go back to a good old standard car”; I was thinking of rivet heads and bare bulbs (R1-9, B, Lo-V) but what they meant was R-33. That was the first time it hit me. just out of curiosity… is there any page out there that breaks down the allocation of how many of which subway cards are currently in service on which lines? The “Current Fleet” section of http://en.wikipedia.org/wiki/N.....ling_stock might be close to what you’re looking for. It shows how many of each type of car are still in service and what lines that type runs on, but not how many of each type run on each line.